December is such a busy month. Most of us are preoccupied buying gifts and making arrangements for the holidays. In North Carolina the weather can be very fickle. One day it is 70 degrees and the next day it can be 30. I am still waiting to see how my winter garden of cabbage, chard and beets will react to these temperature swings. Since gardening activities are at a minimum this time of the year, I try to find other ways to spend time outdoors. I always make it a point to think of the birds and squirrels this time of the year. My bird feeders are full of assorted seeds and sometimes it seems as though I am feeding the squirrels more than the birds, but oh well. I am surprised by how much the birds have been using the bird bath. When the water isn't frozen on warmer days the birds still seem to enjoy taking a quick bath. Because of this, I will continue to freshen the water for them throughout the winter months. I want to do something more creative for my feathery and furry friends, so I decided to hang some assorted treats on tree branches throughout my yard. One easy treat consists of finding a few pine cones in the yard or neighborhood and tie a string on each them so they will hang. Next, make a mixture of peanut butter and corn meal and spread it in the nooks and crannies of the pine cone. Finally, sprinkle the pine cone with bird seed, hang it on a tree branch and watch the birds find it. Another treat consists of a bagel cut in half with a string through the hole to hang it, and you can spread the bagel with the same peanut butter and cornmeal mixture and sprinkle it with seed, chopped dried fruit and unsalted peanuts. Hang the coated bagel from any tree branch or hook on your deck or porch. Birds also enjoy grapes and slices of citrus, apples and bananas. These treats can be put outside on a plate for your birds and squirrels to enjoy. To make your own suet treat, purchase beef fat from your local supermarket and melt it in the microwave. Mix in seed, chopped fruit and peanuts, put it in a container and freeze it thoroughly. Unmold the suet mixture from the container, put it in a mesh plastic bag you have from onions or other produce and hang it outdoors. Take notice of your kitchen scraps. Many of these can be used as outdoor treats. Oranges can be used as cups to hold treats. Birds and squirrels will enjoy munching on the peels and rinds of just about any fruit. You can help your wild friends have a better diet through the winter with just a little effort. 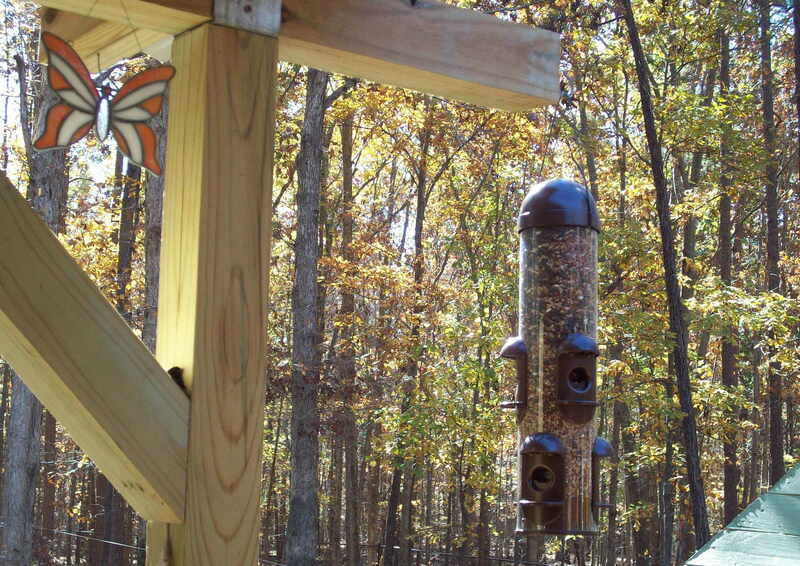 The birds and squirrels will thank you and you will have a lot of fun watching them enjoy their nutritious treats. When the trees start turning color, gardening season isn't over for the year. You can actually grow and harvest vegetables at least into the beginning of winter (even if you don't live in the South). If the idea of growing a winter vegetable garden intrigues you, here are some ideas that will be fruitful. Can you really plant vegetables in the fall? There are lots of vegetables you can plant in September or early October and be eating the produce of your own garden at Thanksgiving (or before). In fact some people feel that cooler fall days give vegetables more flavor than those grown in the summer. The key to knowing what to plant is understanding how long a plant takes to develop and how tolerant it is to frost. What can I actually grow? Radishes grow quickly and fresh radishes are a great addition to a salad for their color and taste. You can even sow radish seeds a week or so apart and have an ongoing harvest. Carrots are very tolerant to frost and small, baby carrots look and taste great. If temperatures drop rapidly, cover them with a few inches of mulch and you can harvest them even after there is snow on the ground. Beets provide great color in the garden as well as in the kitchen. Harvested young, they make a great addition to a salad. After maturity the leaves can be cooked similar to spinach and used in stir fries or as a vegetable by themselves. Cabbage, broccoli, Brussels sprouts, as well as many different varieties of lettuce are some other examples of vegetables you can successfully plant in the fall. Start your vegetables from seeds rather than transplants or "starter" plants. Besides the fact you will have a lot of difficulty finding transplants, seeds are more tolerant to frost so are a better choice. Plant your seeds in your existing garden while cleaning out your summer crop or removing annuals and pruning the perennials. You aren't looking for a large winter garden, rather you're looking for a small space to grow fresh vegetables for the table. Before planting, lightly till the soil with a fork or by hand. Don't add large amounts of organic material to the soil, as it will tend to loosen it and could cause it to dry out quickly. After planting your seeds cover them with soil lightly cover them with a layer of compost. Apply fertilizer along the sides of the plant rows a couple of weeks after planting. Be sure to keep the seeds moist since the cooler fall days will tend to draw moisture out of the soil and compost and the seeds need lots of moisture to germinate and grow strong. Though it's cool outside, in a little time you're have fresh vegetables for your table. A painted gourd makes a unique decoration piece for the Thanksgiving season. Gourds are made from the dried fruit from cucurbitacae plants. The plants produce hard rinds fruit, making gourds the perfect surface for painting decoration and displaying for various purposes. Gourds had many functional uses in history, serving as masks for festivals, holding food and water and musical purposes. When you pick a gourd for a functional purpose such as painting or for decoration, you have to clean and prepare the surface for use. After the gourd is hollowed and dried to a hardened state, smooth and clean the surface to make the gourd more presentable. You can use a mild bleach solution to get rid of any mildew or dirt remaining on the gourd. For a mild bleach solution, mix in a tablespoon of bleach for every gallon on water you use in the solution. Once you use the bleach solution, allow the gourd to dry complete before doing anything else to it. To smooth out any imperfect spots on the surface, use 100 grit sandpaper. This will smooth out rough spots and will take away minor discolorations. Do not oversand the gourd--you want the shell to be as hard as possible. Oversanding spots will result in thinner areas on the shell that can easily be broken. If you are using the gourd for outdoor purposes, you should consider using a preserving agent like copper sulfate to seal and protect the gourd for external weather conditions. Gourds will rot over time, but using sealant will preserve it and its decorations a lot longer. For indoor use, the gourd does not need a sealant because the indoor elements are not as harsh to the gourd's structure. Start by using an oil-based primer to coat the gourd. The primer will allow the paint color to appear bolder and not fade as fast. Let the primer dry before applying your first paint color. Acrylic latex paint works well for painting gourds and will not bead up like other painting solutions. Use a nylon brush to paint the surface to avoid the bristles from scratching the surface. If you are hosting Thanksgiving, use gourds to spice up the table as a centerpiece. If you have several gourds, you can write a guest's names on each one and use them for seat assignments or party gifts. If you want to use the surface as a canvas, you can paint Thanksgiving themed items (like turkeys or fall leaves) on each gourd and use them to decorate your home. For external decoration, consider making a birdhouse or painting a Thanksgiving theme on the front. 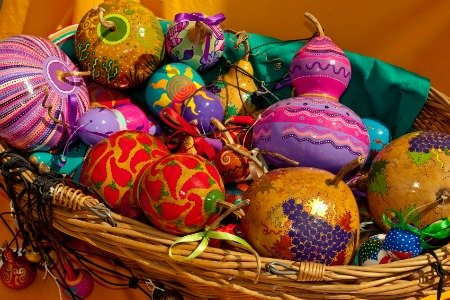 You can also display the gourd on a porch or even make a wreath for the door.